Discuss with your neighbour everything you remember about the structure of benzene. Use the diagram below to jog your memory. Listen to the Voice Thread about Benzene that you created last year. Review your notes and the section in the text about the structure of benzene before continuing. Despite the π-bonds, benzene does not undergo addition reactions like an alkene would. It does however undergo electrophilic substitution. ✍️ Define the term electrophile and give 3 examples. Benzene is an electron rich molecule. This makes it susceptible to attack by electrophiles. It will react with a mixture of concentrated nitric and sulfuric acids to form nitrobenzene. ✍️ Use your text book (and any other sources you need) to make a complete summary of electrophilic substitution. Add the nucleophilic substitution reactions and electrophilic substitution of benzene on to your map. Remember to add as much detail about conditions as you can. This entry was posted in 10/20 Organic Chemistry and tagged benzene, electrophilic substitution, nitration on November 18, 2016 by Merilyn Winslade. Halogenoalkanes are more reactive than alkanes. Reveiw – Why are alkanes unreactive? If you can’t answer this question, you need to review alkanes. ✍️ Draw and name all of the isomers of C4H9Br and classify them as primary, secondary and tertiary. What is different about halogenoalkanes that makes them more reactive than alkanes? Consider the two points that make alkanes less reactive. Is there any differences with halogenoalkanes? ✍️ Define a nucleophile and give 3 different examples. We are only going to be concerned with using hydroxide ion (OH–) in aqueous solution as our nucleophile. When a halogenoalkane is reacted with aqueous OH– an alcohol is produced. ✍️ Draw and name the products of nucleophilic substitution with all the isomers of C4H9Br you drew earlier. We have finished with the standard level material in this section. Time for review! Depending on whether the halogenoalkane is primary, secondary or tertiary, depends on the mechanism for this reaction. Primary halogenoalkanes tend to react via a SN2 mechanism. Tertiary halogenoalkanes tend to react via a SN1 mechanism. Secondary halogenoalkanes use either and you can’t predict which one. Examine the two mechanisms. They are written for any halogenoalkane and any nucleophile. L = leaving group. This is the halogen F, Cl, Br or I.
Nu– = nucleophile. This could be OH– or any other species with a lone pair. Now have a look at the following animation. Here is the link if you want to see the original. There is more than one type of mechanism here so choose unimolecular nucleophilic substitution for SN1 and bimolecular nucleophilic substituion for SN2. What does S and N stand for in the notation of the mechanism (SN2)? The numbers 1 and 2 stand for the molecularity of the mechanism. What does this mean? Define the terms unimolecular and bimolecular. Which mechanism has a carbocation intermediate? Identify it. Which mechanism forms a transition state? What are the coloured arrows trying to indicate in the SN1 mechanism? SN1 reactions are best conducted using protic, polar solvents. SN2 reactions are best conducted using aprotic, polar solvents. ✍️ Draw the structures for the two groups of solvents. ✍️ What is the difference between an aprotic and a protic solvent? Examine the two mechanisms again. ✍️ Write a rate equation for each mechanism. How does the type of halogen affect the rate of reaction? ✍️ Using your data booklet fill in the electronegativities and bond enthalpies for the difference carbon-halogen bonds. ✍️ What trends to you notice? Discuss these with your table. ✍️ Which halogenoalkane would a nucleophile be most attracted to? Despite the polarity of the bonds, the most important factor in determining rate is bond strength. ✍️ Knowing this, rank the halogenoalkaness in order from fastest to slowest for reaction with a nucleophile. Everything you need to know about these two mechanisms is summarised on this sheet here. ✍️ Before trying the review questions, read the relevant section in your text and annotate your notes with any extra important information. This entry was posted in 10/20 Organic Chemistry and tagged alcohol, alkyl halide, halogenoalkane, nucleophiilic substitution, nucleophile, Sn1, Sn2 on November 16, 2016 by Merilyn Winslade. Just as you can oxidise alcohols to form compounds with a carbonyl group, you can then reduce carbonyl containing compounds back to alcohols. Read through your text and annotate your notes find the answers to the questions below. ✍️ What difference is there in the conditions under which the two reagents might be used? ✍️ Which reagent is preferred from the reduction of carboxylic acids and why? ✍️ For the following starting materials, draw the structures and name to products formed when treated with lithium aluminium hydride. This reduction happens via a two step process as summarised below. ✍️ After reading your text or other sources, elaborate on what is happening in both stages in your notes. Make sure you can answer these questions. Why is a protonated phenylammonium ion produced in the first step? 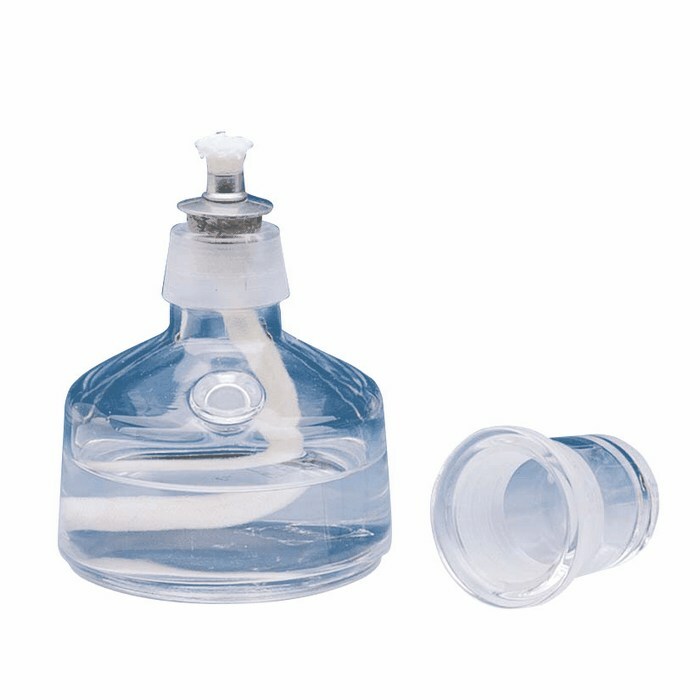 What technique is used to heat the reaction? What is the role of the tin? What is the purpose of using sodium hydroxide in the second stage? This entry was posted in 10/20 Organic Chemistry and tagged carbonyl compounds, ibchem, nitrobenzene, organic chemistry, reduction, topic 20 on November 13, 2016 by Merilyn Winslade. The use of ethanol as a fuel is growing around the world. It is hailed as a more environmentally friendly fuel than fossil fuel because the carbon dioxide released from burning the fuel was what the crop absorbed whilst it was growing meaning that no new carbon dioxide has been added to the atmosphere. Can you see a problem with this logic? 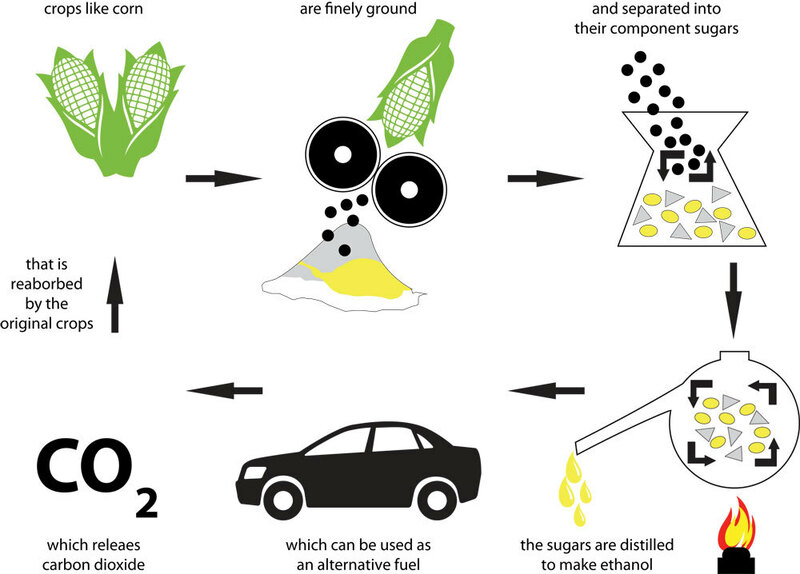 Take a look at the cycle of ethanol production and use below. How ‘green’ is ethanol as a fuel? ✍️ Write equations for the complete combustion of methanol, propanol and butanol. ✍️ Draw the structures and name all the alcohols with molecular formula C4H10O. ✍️ Classify these into primary, secondary and tertiary alcohols. Either of these two reagents can be used. It is important to learn what their colours before and after reaction. ✍️ Draw the full structural formula for each of the alcohols above. ✍️ Classify them as either primary, secondary or tertiary. She decided to try reacting the alcohols with acidified sodium dichromate(VI) in one trial and acidified potassium permanganate(VII) in the other. 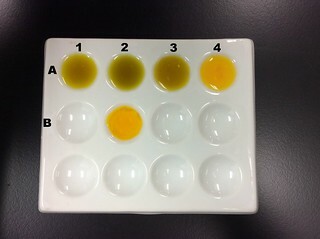 She set up the two trials as shown below with these reagents. 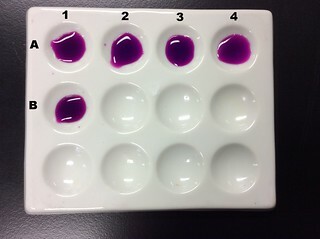 Acidified potassium permanganate(VII) BEFORE reaction with alcohols. After 15 minutes, she observed the following changes. ✍️ From her results, which types of alcohols (primary, secondary and/or tertiary) undergo oxidation? 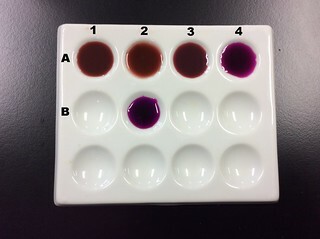 ✍️ The tray with the potassium permanganate(VII) showed a reaction but a brown precipitate formed in the wells. What is this? For now we aren’t going to worry about trying to balance these redox equations but instead just focus on what happens to the alcohol. This will depend on whether the alcohol is primary secondary or tertiary. 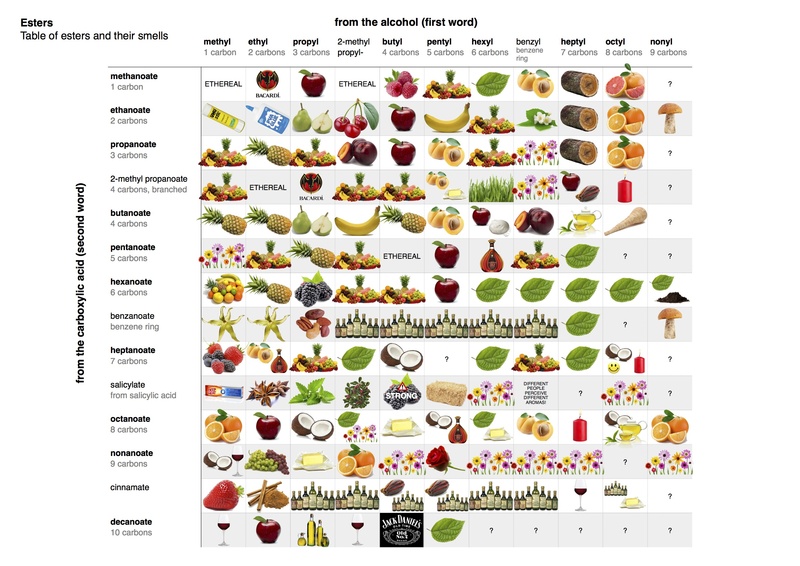 Below is a diagram representing the different possibilities for the oxidation of alcohols. ✍️ After examining the chart, what were the products of the reactions in each of the wells A1, A2, A3 and A4? Techniques for heating and recovering products in organic chemistry. Butan-1-ol is reacted with stoichiometrically equivalent amounts of acidified potassium permanganate (VII) and the product is removed by distillation as it is formed. Methanol is reacted with excess acidified sodium dichromate (VI) and heated under reflux before the product is removed by distillation. Butan-2-ol is reacted with excess acidified potassium dichromate (VI) and heated under reflux before the product is removed by distillation. Methylpropan-2-ol is heated under reflux with excess potassium permanganate (VII). Esterification is a type of condensation reaction where an alcohol and a carboxylic acid are combined to form an ester. ✍️ Write the equation (using structural formula for all organic compounds) between ethanol and butanoic acid. 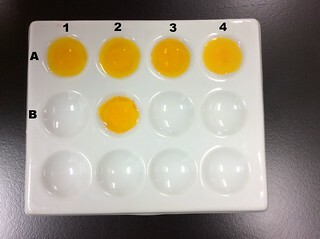 Name the ester produced. So far we have talked about alkanes, alkenes and alcohols. We have also made halogenalkanes, aldehydes, ketones, carboxylic acids and esters in our discussions. ✍️ Discuss at your table how you could make ethanoic acid from ethene. What reagents would you need and under what conditions (heat, reflux, distillation) would you use at each step? ✍️ Construct a map that connects the types of compounds we have discussed so far. Over the arrows, put the conditions and reagents needed for the reactions. This entry was posted in 10/20 Organic Chemistry and tagged alcohols, ib chem, organic, topic 10 on November 10, 2016 by Merilyn Winslade. Alkenes are more reactive than alkanes. Electrons in π bonds are not as strongly attracted to the nuclei as the electrons in the σ bond. This makes the π bond weaker. ✍️ HL – What is the hybridisation of carbon in this molecule? If you can’t answer that question, you need to revise this section from bonding. ✍️ Review this summary of alkenes and add your own summary to your notes. Include an example of the reaction that occurs when adding bromine water to an alkene. ✍️ What type of reaction is occurring in the alkene test tube? ✍️ If left overnight, the test tube containing the alkane would also decolourise. Write a set of equations to explain this and identify the type of reaction occurring. ✍️ Write the equation for the reaction of but-2-ene with each of the following reactants above. Use structural formulae in the equations and name the product each time. ✍️ What classes of compounds can be made from addition reactions of alkenes? View the video found on this page. Review pages 3 and 4 of this summary and write your own notes. Make sure you view both the animations. Key terms to remember here are monomer and polymer. Make sure you can define both and know how one relates to the other! Try the polymer puzzles found here. Alkenes are useful compounds. You can read about them here. This concludes the material for standard level. You should now read the section in your text book (10.2) which is relevant to alkenes and addition polymerisation and add any thing else you find important to your notes. What do you think the curly arrows are representing? What does r.d.s stand for? Why is the second step faster than the first step? The above diagram is the general mechanism for electrophilic addition of any halogen (X2), halogen halide (HX) or interhalogen (eg I-Cl or iodine monochloride) with any alkene. ✍️ Draw the mechanism for the bromination of ethene. Remembering that an electrophile is an electron deficient species, how is Br2 considered an electrophile in this mechanism? Below is the reaction between propene and HBr. As you can see, there are two possible products. One is more likely than the other. ✍️ Draw the mechanism to create both the products. ✍️ Use your textbook to read about this rule and write a summary to explain why the major product is 2-bromopropane and not 1-bromopropane in terms of the stability of the carbocation. This entry was posted in 10/20 Organic Chemistry, General and tagged addition, addition polymerization, alkenes, electrophillic addition, polymerisation, polymerization on November 3, 2016 by Merilyn Winslade. Watch the following video and take your own notes. Write and balance the equations for the complete and incomplete combustion of methane, methanol, butane and butan-1-ol. Find the equation for the reaction of methane with chlorine and the reaction of ethane with bromine. Are these reactions fast or slow? What happens if excess halogen is added? Watch the following video. WARNING! – turn off the sound! It breaks down the steps involved in the reaction between methane and chlorine. Take note of the equations that occur at each of the 3 steps – initiation, propogation and termination. Study these steps and try and memorise them. Use the same pattern to now write the free radical mechanism for the reaction between ethane and bromine. This entry was posted in 10/20 Organic Chemistry and tagged alkanes, IB, organic, topic 10 on November 11, 2014 by Merilyn Winslade. This is a series of seven videos that covers the structures and naming of all the standard level compounds that you need. View each video and take notes. Make a summary of the different types of functional group and how to name them. This could take the form of a table. Below is an example of a summary table prepared for another course. Check the syllabus to make sure you include all the different types of compounds required by the IB. HL has extra compounds mentioned in 20.1.1 and 20.1.2 of the syllabus. Try these problems once you have learnt the different functional groups. Need more practice? This is a page with links to multiple sources for naming practice. This entry was posted in 10/20 Organic Chemistry and tagged isomerism, IUPAC, nomenclature, organic on November 4, 2014 by Merilyn Winslade. View the four videos and take your own notes on each. If there is something you don’t understand, seek assistance before proceeding to the next step. Try the following questions and check the answers. This entry was posted in 10/20 Organic Chemistry and tagged Organic Intro on November 4, 2014 by Merilyn Winslade. Here is the review of this topic for SL. HL students should also take a look at this before reviewing the HL only material. Define a homologous series – put this definition on your definitions page! Use your knowledge about intermolecular forces (from the Bonding topic), to predict which compounds will have higher boiling points. Understand the difference between a molecular, structural and empirical formula. Describe and recognise structural isomers with the same molecular formula. Use your knowledge of polar and non-polar compounds and intermolecular forces (both from the Bonding topic) to discuss the volatility and water solubility of organic compounds. First of all, make a note of any of the points above you are not sure of. Review your notes from class. Have a look at one or all of the videos that specifically address these points. identify primary, secondary and tertiary alcohols and alkyl halides. Note any of the above functional groups that you can’t recognise and/or name. Make flashcards or use a program like Quizlet that has them already made for you! Use the videos below to help you if you aren’t sure which compound is which or how to name them. In this section, you will learn about the reactivity and reactions of alkanes. You will review the following syllabus points. Explain why alkanes are relatively unreactive. Write equations for the complete and incomplete combustion of alkanes. Write equations for the reaction of alkanes with a halogen. Write the free radical mechanism for the reaction of methane or ethane with either chlorine or bromine. For the free radical mechanism, you will only need to be able to write it for methane or ethane. Learn them. It follows a pattern. Check out these videos if you are completely stuck. Questions – (mechanism questions will come at the end of this review post). Write equations for addition reactions between alkenes and halogens, hydrogen, water and hydrogen halides. Describe with equations and observations the test for distinguishing between alkanes and alkenes. Draw sections of addition polymers given the monomer and vice versa. Say why alkenes are important. Review your notes from class, including notes in your lab book and experiments we’ve done with alkanes and alkenes. Use the videos to help if you get stuck. If you are still unclear on any of the points above, DO NOT proceed to this section. Once you are satisfied that you get everything, then, and only then, try the following more difficult questions. Many of the questions are similar, so if you get one wrong, study the answer until you understand it, and then try another similar question the next day. This entry was posted in 10/20 Organic Chemistry, Grade 11 Chemistry and tagged IB, ibchem, organic chemistry, review, revision, SL, topic 10 on March 2, 2014 by Merilyn Winslade. These simulations are great for understanding what is happening during these reactions. This entry was posted in 10/20 Organic Chemistry and tagged 3D, chem tube 3D, ibchem, nucleophilic substitution, simulation, Sn1, Sn2 on February 20, 2014 by Merilyn Winslade.